Mean Well Waterproof LED Power Supply 480W - 12VDC NEW! 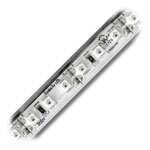 This product is a waterproof IP65 rated Mean Well brand 480W, 12VDC LED transformer designed to convert 100-240VAC or 277VAC power to 12VDC. 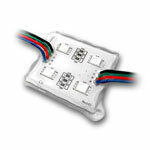 With a 40A maximum output this transformer can drive up to 480 watts of 12VDC constant voltage LED lights. Cooled by free air convection this power supply doesn't require a noisy fan for cooling and can be used in indoor applications where fan noise is bothersome. 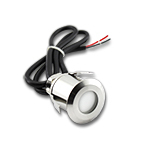 The 100-240VAC input requires a minimum of a 7 amp circuit to carry the current on full load and the 277 would require at least 2.9 amps. 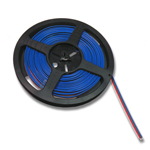 The 3 conductor AC input wire (18AWG) and both 2 conductor DC output wires (14AWG) are 11.5" long and require a bare wire connection. 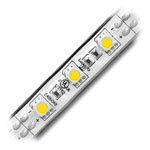 It is recommended that each DC output drives no more than 20 amps of current. Each Mean Well HLG-600H-12A transformer is equipped with built in PFC (Power Factor Correction), short circuit, over current, over voltage, and over temperature protection and can withstand a 5G vibration test. 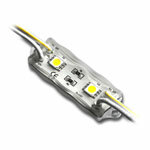 This product is intended for indoor / outdoor use, non-submersible, non uv-proof, UL recognized, RoHS, FCC and CE approved.